After a few months of grumbling often about the Boston summer heat, my dreams of consistently cooler weather have come true. The temperature in Boston has finally dropped into the 50s, and I finally feel refreshed and content in it. Nothing makes me happier than waking up to a chilly morning, wrapping my hands around a mug of steaming hot black coffee and finally feeling clean, crisp and completely energized. I’m savoring and appreciating every minute of it while it lasts, although the 30 to 40-degree weather around the corner is nice too. With this official shift in temperature, I’ve become obsessed with all things carby and warm in the kitchen, and making homemade ravioli is a nice way to literally immerse myself in those two things. Ever since I made my first batch of it, I’ve become smitten with the process. There is something so incredibly satisfying and relaxing about watching the dough transform from a crumbly pile into a smooth, cohesive and clean shape and then rolling it out by hand as thinly as possible before creating and cutting the ravioli itself. 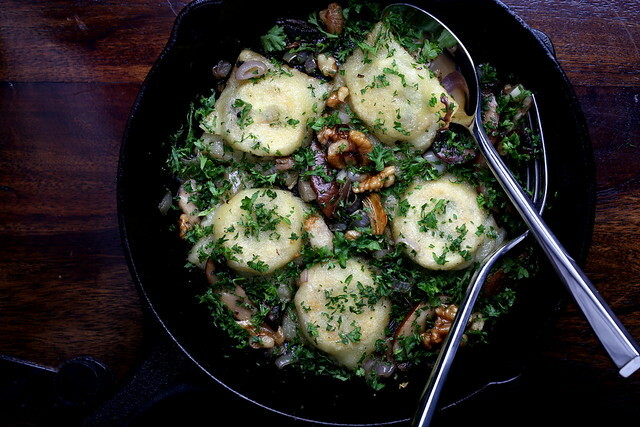 As far as what goes inside of the ravioli, anything will do, but I’ve found that equal parts cultured cashew cheese and Daiya provide the perfect subtle tang and gooeyness that pairs well with a white wine sauce packed with walnuts, shallots and parsley. Tofu or cashew ricotta also works well, as will any commercially prepared vegan cheese. The ravioli can also be stuffed with mushrooms, squash or spinach, and I’ve found that grinding up Field Roast sausages works nicely too, and these things pair best with a tomato sauce. The practical part about making this ravioli is that it can (and should be) frozen before boiling and toasting it, which makes this an ideal, non-fussy dinner for multiple guests or a quick dinner for two. All the prep that’s needed is pulling the ravioli out of the freezer to slightly thaw while you make your sauce and, once the ravioli is softened, a quick boil is all that’s left to do. In this application, I boiled then gently toasted the ravioli in a cast iron pan before adding the white wine sauce. It adds a little texture to the ravioli, and the subtle caramelization tastes nice with the sauce components. Mix the semolina and rice flours together in a Kitchen Aid mixer. Make a well in middle, then pour in Ener-G/water/olive oil mixture. Knead with the dough hook on low until evenly crumbly. Slowly add in 1/8 cup water and process with the dough hook for 1 minute. Add in the rest of the water (1/8 cup) and knead for 1 min more. By this time, all of the dough should adhere together nicely, but still be a bit shaggy. Continue to process the dough for about 2-3 minutes more. If needed, add 1-2 TB water to bring the dough together. After this time, the dough should be smooth and silky. If it is tough or shaggy, add 1-2 TB water and process for another minute. If it is sticky, add a bit more rice flour, only 1-2 teaspoons and process until smooth. Once the dough is done, separate it into 3 pieces, then cover it with damp towel and allow it to rest for 20 minutes. During this time, the gluten will have relaxed a bit, making it easier to roll out. Keep the other spheres of dough under the damp towel while you make your ravioli. Using a Norpro ravioli maker, follow these steps to make your ravioli. Remove the desired amount of pasta from the freezer and allow to it to thaw. Bring a large pot of water to boil while you make your sauce. To make your sauce, heat the vegan butter and olive oil together over medium-low heat. Add in the shallots and cook until softened, about 2 minutes. Throw in the garlic and saute for about 30 seconds, then add in the mushrooms and saute for 3 minutes more. Next, turn the heat up to medium high. After a minute, add in the wine to deglaze the pan, stir, then add in the broth. Throw in the walnuts and allow to the sauce to slightly reduce under the lowest heat setting while you boil your pasta. By now, your water should be at a full boil. Add a little salt and oil to the water, then slowly drop in half of the ravioli (6 pieces). The cold temperature of the pasta will likely cause the water to momentarily stop boiling. Just wait for it to return to a boil, then add in the other half of the ravioli. Boil for 3-4 minutes, flipping the pasta over once during the boil time. 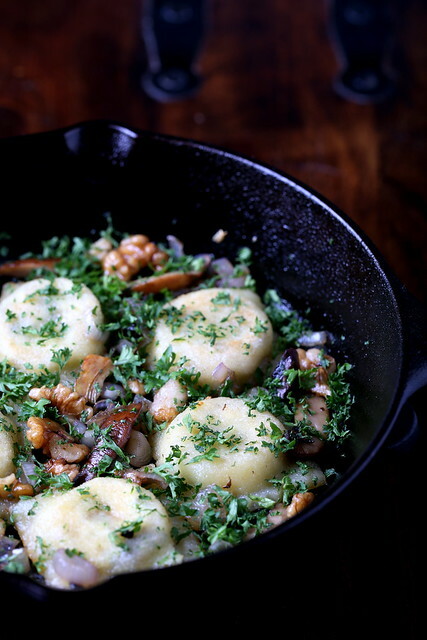 Serve the ravioli with the sauce, sprinkling with salt, pepper and fresh parsley. Flour your work area with plenty of rice flour while rolling it out. Roll the pasta spheres out into a long, thin piece, with the width being slightly wider than the pasta maker. This will allow you to fold the pasta over the top of the pasta maker nicely. You can use the leftover dough to make an additional 12 pieces of ravioli. Thanks for this awesome gluten free and dairy free Ravioli. I can't wait to try this! I hope you like, Claire! Just to be clear, this is not a gluten-free pasta. Semolina flour has a very high gluten content, and I just cut it here with a naturally gluten free rice flour to yield a softer pasta.